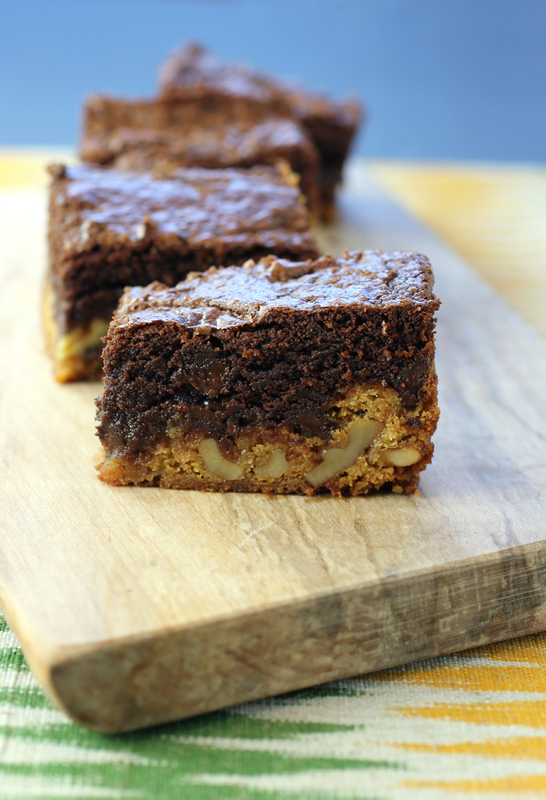 A chocolate brownie and a butterscotch blondie all in one bite. When it comes to switching jobs, breaking up with a significant other, moving to a new city or other countless life decisions we hesitate to make, how many of us have gotten out pencil and paper to make the proverbial pros and cons list? I know I have. Plenty of times. It always helps. Even if I’m often startled to see how lopsided the count ends up being. Thankfully, there are times when you don’t have to choose one over another. It’s rare. But occasionally, you can enjoy the best of both worlds without having to wrack your brain to take a side. 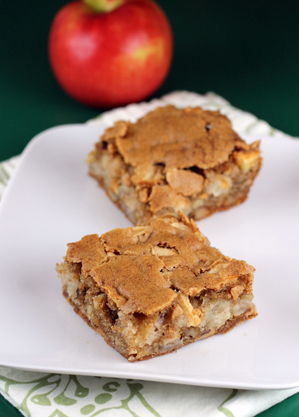 “Butterscotch and Fudge Brownie Bars” is just such a case. Do I want a brownie? 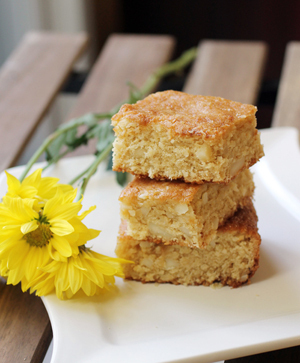 Or do I want a butterscotch blondie? Hmm. Why not indulge in both? With this recipe, you get exactly that. 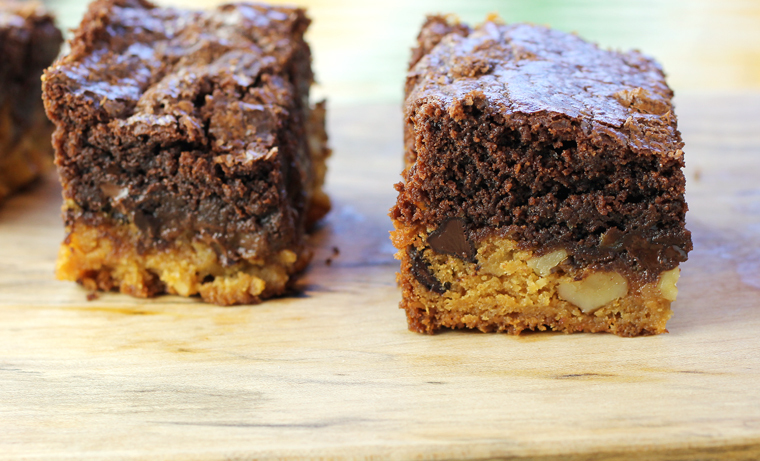 It’s a fudgy brownie on top of a sweet blondie. It’s two treats in one — in every single bite. The recipe is from the oldie but goodie cookbook, “The Essential Chocolate Chip Cookbook” (Chronicle Books, 2008), of which I received a review copy when it was first published, and has since had a prominent place on my bookshelf. 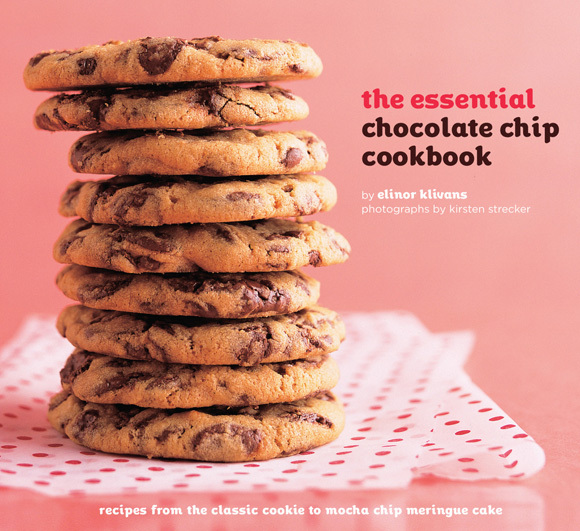 It’s by longtime food writer and cookbook author Elinor Klivans. And it includes every type of chocolate chip treat under the sun — from “Kitchen-Sink Chocolate Chip Cookies” to “Chocolate Chip Cookie and Cream Tart” to “Hot Chocolate Chip Brownie Sundae Cake.” Is it any wonder that I’ve kept this book so long? It’s what I reach for whenever I find myself with a load of chocolate chips, either because there was a good sale at the store or a manufacturer such as Burlingame’s Guittard Chocolate Company sends me samples to try. Guittard’s new Akoma Extra Semisweet Baking Chips and Butterscotch Baking Chips. The latter is what prompted this baking spree. 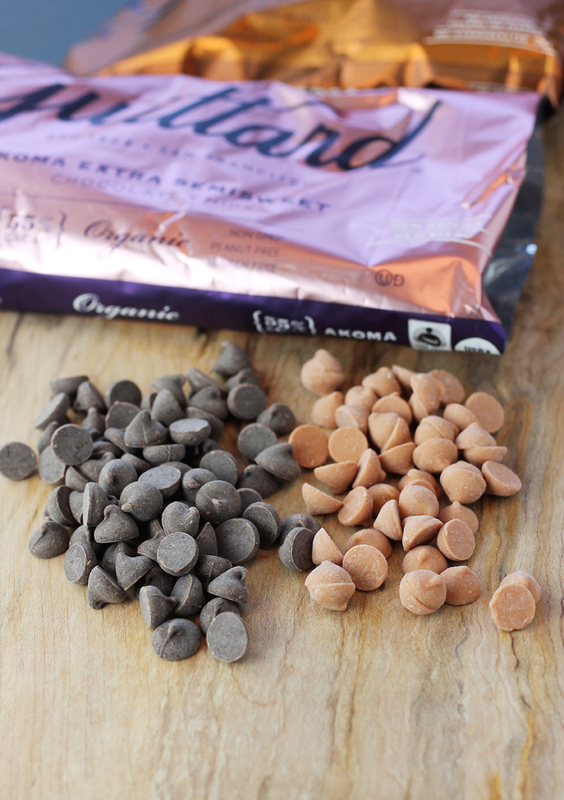 Guittard just announced this year that its line of chocolate chips is now Fair Trade certified. Moreover, its Akoma Extra Semisweet chips are both certified Fair Trade and USDA organic. The Akoma Extra Semisweet 55 Percent is named for the traditional Adinkra symbol of West Africa that represents “heart.” The taste is smooth, rich, intensely chocolatey and just a little fruity. The regular Fair Trade chips are $4.49 for a 12-ounce bag. The Akoma is $5.49 for a 12-ounce bag. Butterscotch chips are not always easy to find in stores for some odd reason. So I ordered from Amazon the Guittard Butterscotch Baking Chips, which have a bang-on butterscotch-toffee flavor. 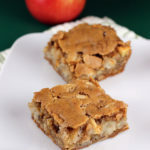 This bar cookie is easy to make. 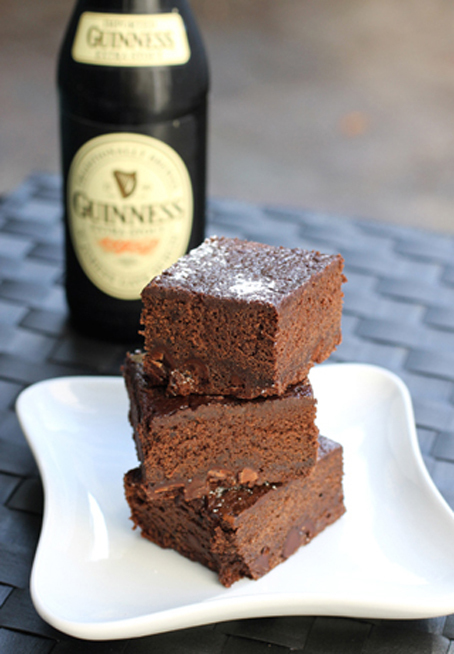 But it does require a few more steps than just a simple pan of brownies. That’s because you make one batter, divide it, then add melted chocolate to one portion, and melted butterscotch chips and walnuts to the remainder. 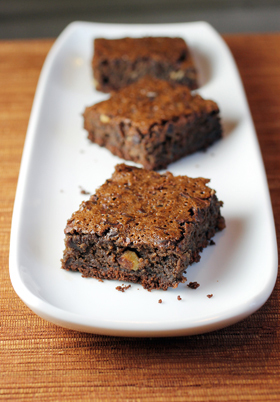 For even more decadence, handfuls of chocolate chips are sprinkled between the layers. To say this is a chocolate lover’s dream would be an understatement. 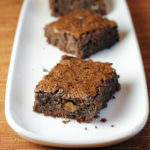 As you can see from the photos, the brownie layer ends up being heftier than the butterscotch layer. But if you like, you can always take matters into your own hands to get the ratio you prefer. For instance, if you want a larger butterscotch layer, just increase the stated 2 cups of batter you use to mix with the butterscotch chips to maybe 1/3 cup more batter instead. That’s it for the decisions. 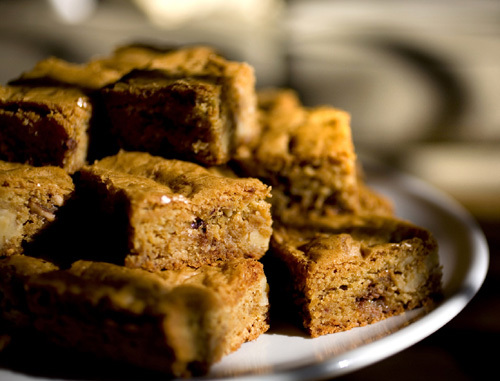 Because when it comes to this cookie bar, it’s all pros. No cons. Position a rack in the middle of the oven. Preheat the oven to 350 degrees. Butter a 9-inch square baking pan and line the pan with a piece of parchment paper that is long enough to extend over two opposite sides of the pan. Butter the paper. Put 1 cup of the chocolate chips in a heatproof bowl or the top of a double boiler and place it over a saucepan of barely simmering water (or the bottom of the double boiler), the water should not touch the bowl. Stir until the chocolate chips are melted and smooth. Set aside. Put the butterscotch chips in another heatproof bowl or the (clean) top of the double boiler and place it over the saucepan of barely simmering water (or the bottom of the double boiler); the water should not touch the bowl. Stir until the butterscotch chips are melted and smooth. Set aside. In a large bowl, using an electric mixer on medium speed, beat the butter and brown sugar until smoothly blended, about 1 minute. Stop the mixer and scrape the sides of the bowl as needed during mixing. Add the eggs and vanilla and mix until blended, about 1 minute. The mixture may look slightly curdled. On low speed, add the flour mixture, mixing just until it is incorporated. Spoon 2 cups of the batter into a medium bowl. Use a large spoon to stir in the melted butterscotch chips until smoothly blended. Stir in the walnuts. Scrape the butterscotch batter into the prepared pan. 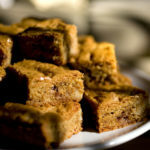 Sprinkle the remaining 1 1/2 cups chocolate chips over the butterscotch batter. Stir the melted chocolate chips into the remaining batter in the bowl until smoothly blended. Drop spoonfuls of the chocolate batter over the chocolate chips and then use a metal spatula to spread the chocolate batter evenly over the chocolate chips. Some chocolate chips may get mixed into the chocolate batter — this is fine. 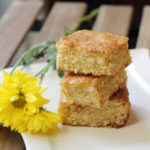 Bake just until the top feels firm when lightly touched and a toothpick inserted in the center comes out clean or with a few moist crumbs clinging to it, about 40 minutes. If the toothpick penetrates a chocolate chip, test another spot. Transfer the pan to a wire rack to cool completely, about 1 hour. Loosen the sides of the brownie from the unlined sides of the pan and use the ends of the paper to lift the brownies from the pan. Use a large sharp knife to cut the brownies into 16 or 25 pieces and then a wide spatula to help slide the brownies off the paper. 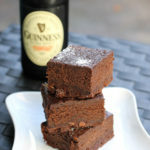 The brownies can be covered and stored at room temperature for up to 3 days. i love butterscotch chips! i don’t find that they taste very much like real butterscotch, but i devour them just the same. i’d love these bars! Love Guittard. I used to bake with their chips a lot.